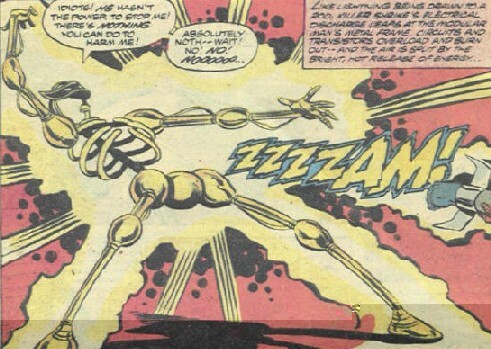 Powers/Abilities: In his exo-skeleton, the Modular Man could reconfigure his body to his liking. He had a number of detachable weapons, such as a gas gun and others that are unrevealed. He originally had about class 10 strength, and superhuman durability, and a flexible frame resistant to injury. He can absorb microwave energy to grow in size and power. After absorbing large amounts of microwave energy, his strength increased to class 100. (Marvel Team-Up I#90 (fb)) - Little is known of the past life of Dr. Stephen Weems. He was a scientist working for the Brand Corporation who had been working on an experiment in molecular dissolution involving the use of microwaves. The experiment backfired, and Weems' physical body was badly damaged, causing his molecules to begin to drift apart. Weems acted rapidly and designed a metal exo-skeleton, specifically ionized to hold his separating body together, albeit in a diffused and intangible form. Weems made an arrangement with the organization known as the Conspiracy: they would cure him if he assisted them in their plot. They codenamed Weems "The Modular Man" due to his ability to disassemble and reassemble his body, and due to the number of detachable components of his body. (Rampaging Hulk I#2) - The Conspiracy then disassembled Weems and mailed him to Delenor Hospital, where another one of their agents, the Killer Shrike, was comatose after being electrocuted in battle with Ulysses Bloodstone. Since the Shrike was considered a security risk, two members of the Delenor Hospital mailroom, Malcolm and Allyn, opened the package. Letting curiosity get the best of them, they assembled the pieces and rebuilt the Modular Man before contacting security. 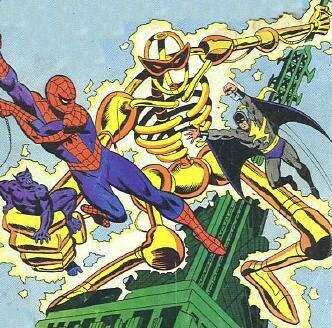 (Marvel Team-Up I#90 (fb)) - The Modular Man then made his way to the Shrike's room and took his unconscious form. Weems met with his contact in the Conspiracy, Jocko, who apparently had big plans for the two of them. However, the leaders of the Conspiracy were killed in the process of attempting to gain the power of the Hellfire Helix, and all of their plans dissolved. 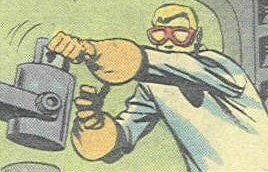 (Marvel Team-Up I#90) - The Modular Man somehow revived the Shrike, who suffered from temporary amnesia. 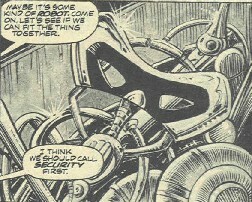 Weems convinced the Shrike to help him in exchange for revealing the Shrike's past to him. The two snuck into a Physical Science Exhibit at Empire State University and stole a microwave-driven cellular condenser that Weems claimed would help him regain his normal form. Both Spider-Man and the Beast were present at the exhibit and attempted to stop them, but were overpowered. Still needing a powerful source of microwaves, Weems and the Shrike flew a helicopter over the antenna on the Empire State Building, in anticipation of a new cable television broadcast, which was powered by microwaves. The Beast, however, had deduced that the two would need a source of power and reasoned that the cable hook-ups at the Empire State Building were the only really powerful source of microwaves in the area. Spider-Man had followed the Beast using a Spider-Tracer. When the broadcast began, Weems was first racked with pain, but then began to grow in size and power. The Modular Man revealed his true intent: he had been trying to become a being of pure energy, and using the modified condenser and the concentrated microwaves, he would free himself of any bodily limitations and "enjoy power beyond that which any man has ever known." The Shrike expressed concern of Weems' plans for him, but the Modular Man told him he was of no interest and swatted him unconscious. Weems began ranting about beginning a reign of terror unparalleled in history, causing the "human vermin that crawl on the Earth to know--and fear him!" The Beast figured that a good jolt of lightning might scramble the Modular Man like it would a tv transmission. He and Spider-Man touched the Shrike's gauntlets together and fired a bolt of electricity at the Modular Man, which overloaded and burned his circuits and transistors. Weems' intangible form was forced out of the Modular Man exo-skeleton, and dispersed into thin air. The Modular Man was created by John Warner and Val Mayerik as part of the Bloodstone back-up series in the original Rampaging Hulk Magazine. The series suffered the sudden "change of writer-syndrome" and was brought to sudden conclusion by another writer. The original use for which the Modular Man was intended may never be known. His origin and final fate were detailed by Steven Grant. Weems obviously had a rough childhood and wanted revenge on the whole world.